Agnes Anna Schwert was born in Buffalo, New York on September 12, 1898. She was the daughter of Johann (= "John") and Augusta (née Lorenz) Schwertfeger/Schwert. Agnes was baptized on September 18, 1898, by Fr. Ferdinand Kolb, Saint Boniface R.C. Church, 124 Locust Street, Buffalo. An annotation on Agnes' baptismal record indicates that she married Joseph J. Demske / Demski on July 19, 1915(?) at Saint Nicholas R.C. Church in Buffalo. Joseph was a son of Joseph and Anna (née Muhl) Demske / Demski. Joseph Sr.'s own heritage traces to the village of Uhlkau, south of Danzig in West Prussia. Joseph Jr. was born in Buffalo on March 20, 1896, and he was baptized as "Joseph Demski" at Saint Boniface R.C. Church on March 29, 1896. Agnes died of peritonitis on June 27, 1923. She is interred in an unmarked grave in Lot 11, Section 15½, United German & French Cemetery (Pine Hill), Cheektowaga, NY. 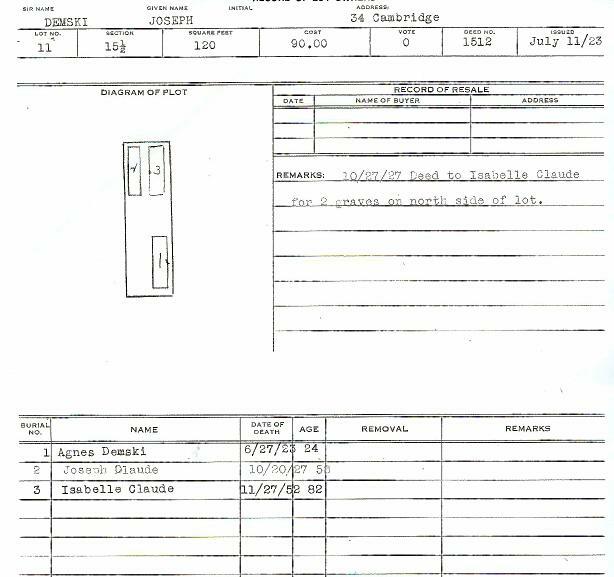 (Note that the interment record apparently lists her month of death incorrectly). Joseph died of hypernephroma kidney on February 5, 1949. 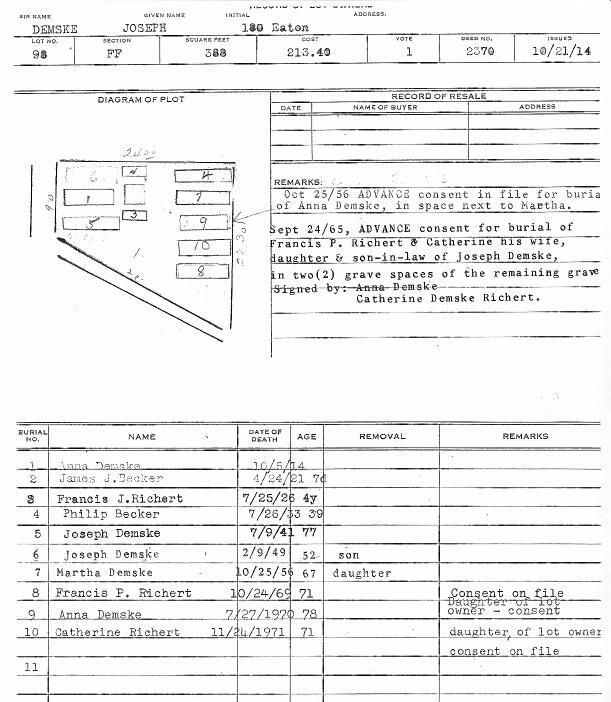 He is interred in an apparently unmarked grave in Lot 98, Section FF, United German & French Cemetery (Pine Hill), Cheektowaga, NY, adjacent to the graves of his parents. 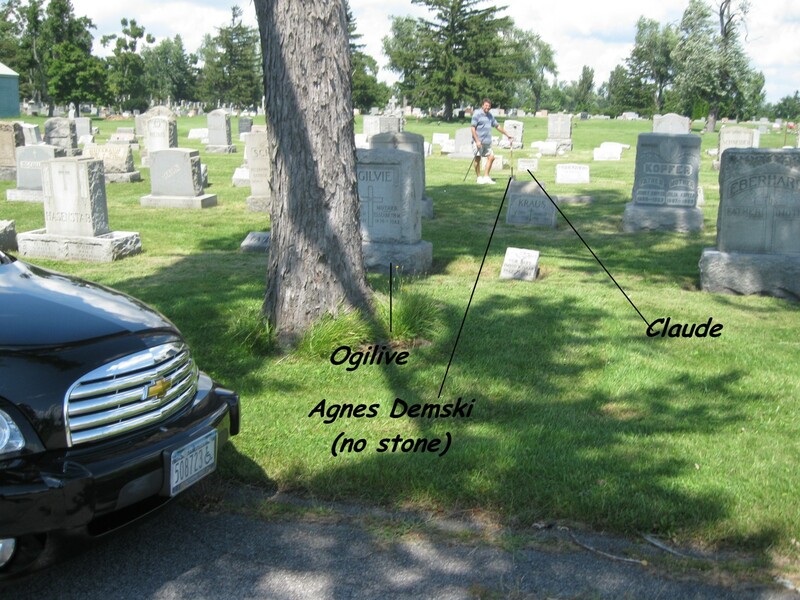 General location of the grave of Agnes (née Schwert) Demske/Demski, Lot 11, Section 15½,United German & French Cemetery (Pine Hill), Cheektowaga, NY. A map to locate the grave is available here. Grave (unmarked) of Agnes (née Schwert) Demske/Demski, Lot 11, Section 15½,United German & French Cemetery (Pine Hill), Cheektowaga, NY. 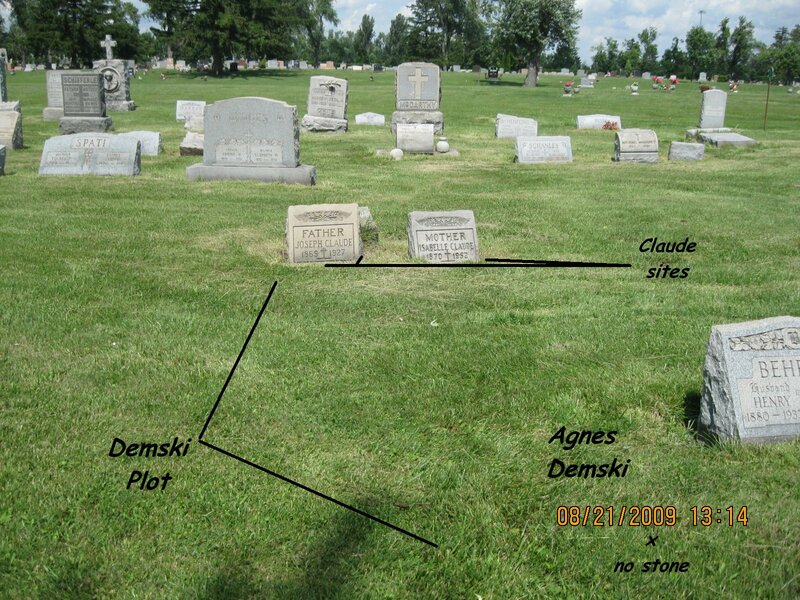 General location of the grave of Joseph J. Demske/Demski, husband of Agnes (née Schwert) Demske/Demski, Lot 98, Section FF, United German & French Cemetery (Pine Hill), Cheektowaga, NY. 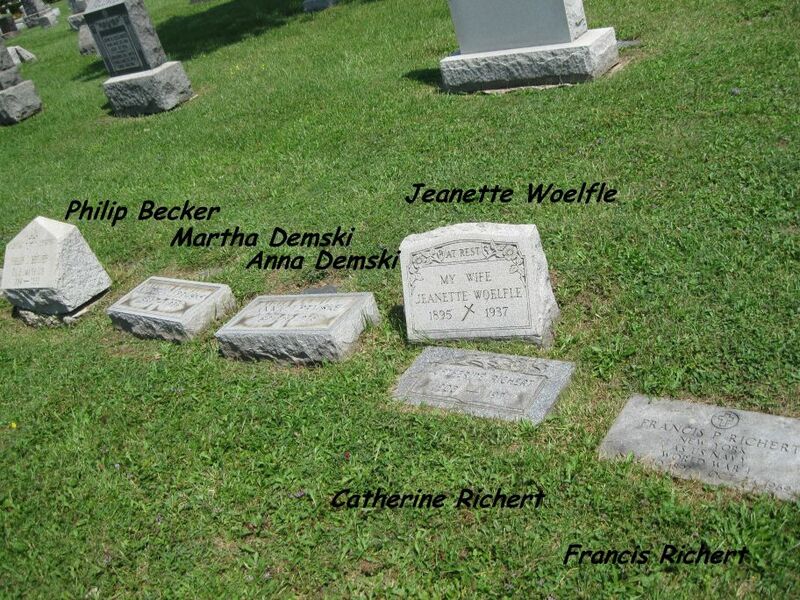 Joseph is interred in an unmarked grave here along with his parents Joseph and Anna (née Muhl) Demske/Demski, plus siblings Anna, Martha, and Catherine (née Demske) Richert. A map to locate the gravesites is available here. Grave (unmarked) of Joseph J. Demske/Demski, husband of Agnes (née Schwert) Demske/Demski, Lot 98, Section FF, United German & French Cemetery (Pine Hill), Cheektowaga, NY. Joseph is interred here along with his parents Joseph and Anna (née Muhl) Demske/Demski, plus siblings Anna, Martha, and Catherine (née Demske) Richert. Baptismal Record: Joseph Demski, born on March 20, 1896, baptized on March 29, 1896, Saint Boniface R.C. Church, Buffalo, NY. Baptismal Record: Agnes Anna Schwert, baptized on September 18, 1898, Saint Boniface R.C. Church, Buffalo, NY. Obituary: Agnes (née Schwert) Demske/Demski, died June 27, 1923. Interment Record: Agnes (née Schwert) Demske/Demski, died June 27, 1923, interred June 30, 1923, (Interment record apparently lists the month of death incorrectly). 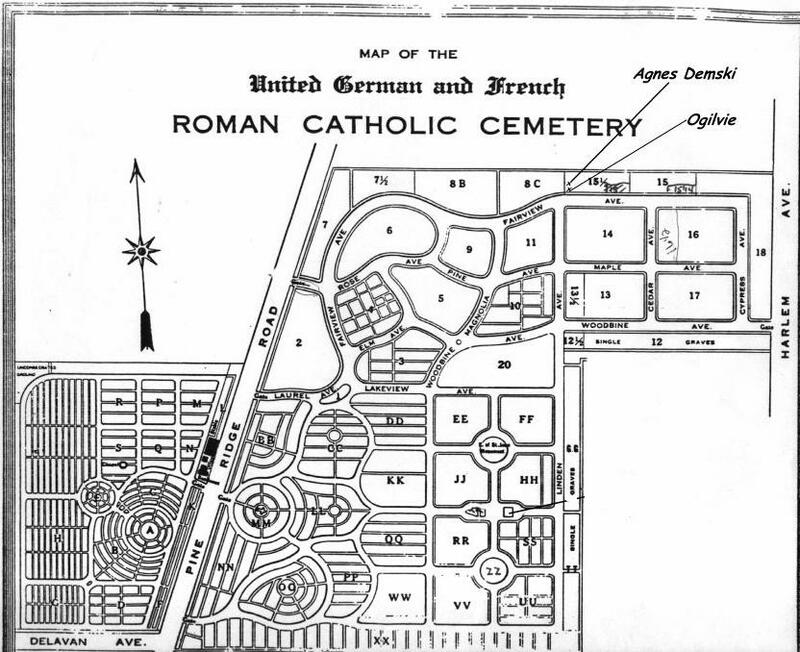 Lot 11, Section 15½, United German & French Cemetery (Pine Hill), Cheektowaga, NY. 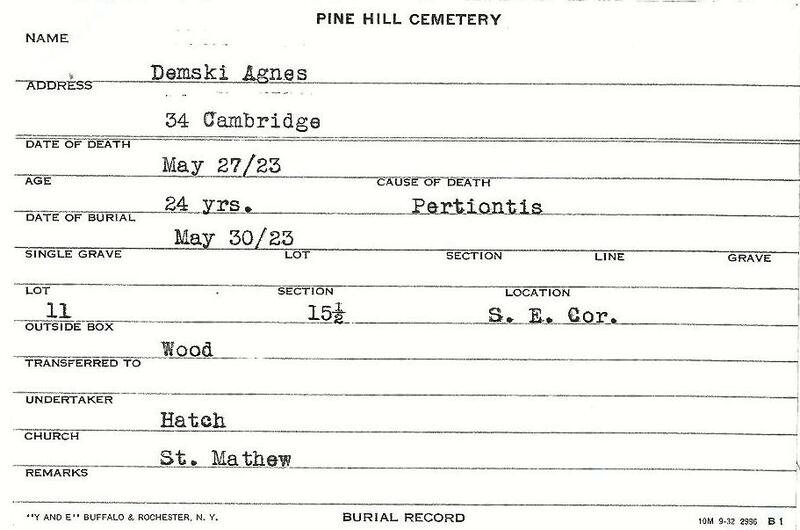 Cemetery Plot Record: Agnes (née Schwert) Demske/Demski, died June 27, 1923, Lot 11, Section 15½, United German & French Cemetery (Pine Hill), Cheektowaga, NY. Cemetery Plot Map: Detailed plot map for locating the grave of Agnes (née Schwert) Demske/Demski. 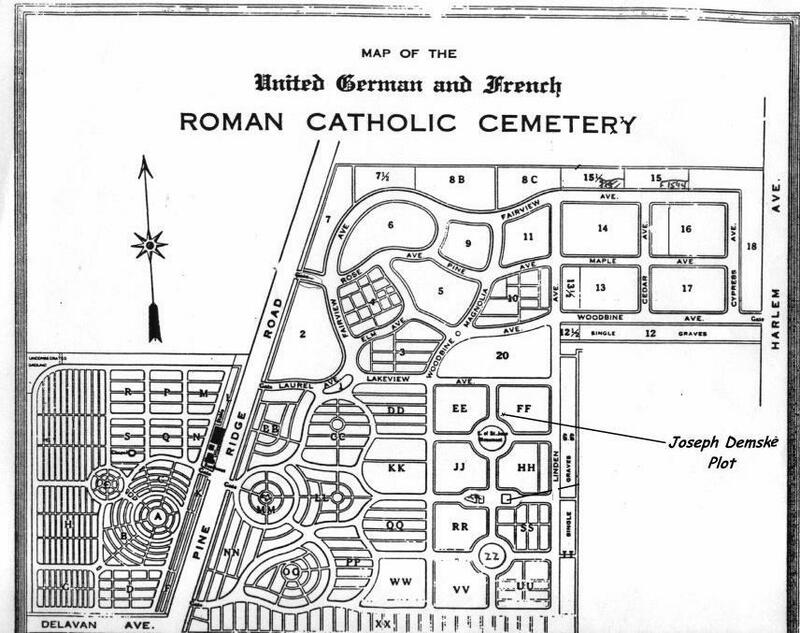 Lot 11, Section 15½, United German & French Cemetery (Pine Hill), Cheektowaga, NY. Obituary: Philip J. Becker, husband of Harriet (= "Hedwig") (née Demske/Demski) Becker. Harriet was sister to Joseph Demske/Demski, Jr. Philip died in Buffalo, NY on July, 1933. 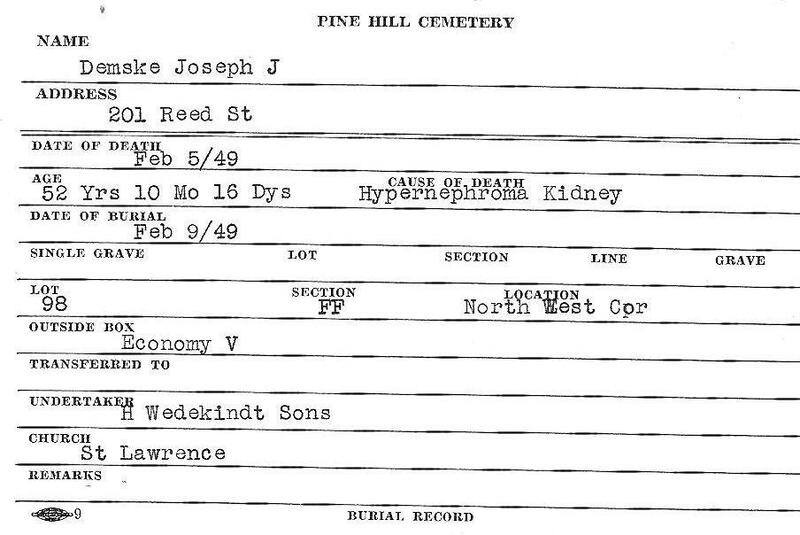 Cemetery Plot Record: Joseph and Anna (née Muhl) Demske/Demski, plus their children Joseph J., Anna, Martha, and Catherine (Richert). 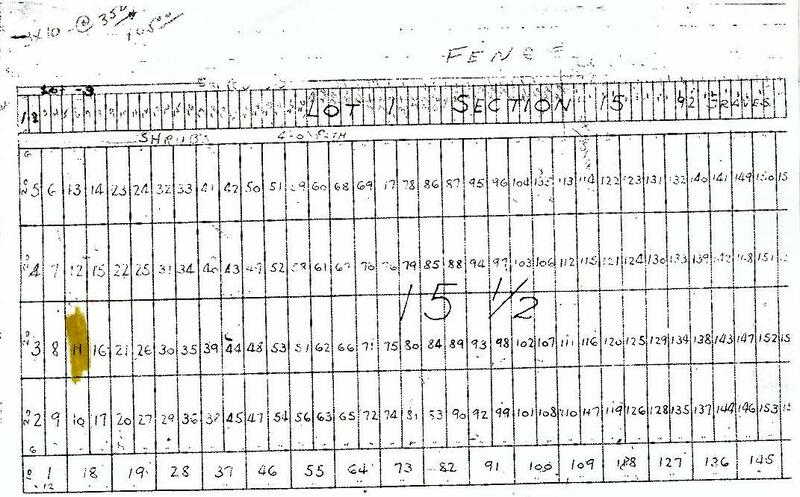 Lot 98, Section FF, United German & French Cemetery (Pine Hill), Cheektowaga, NY. 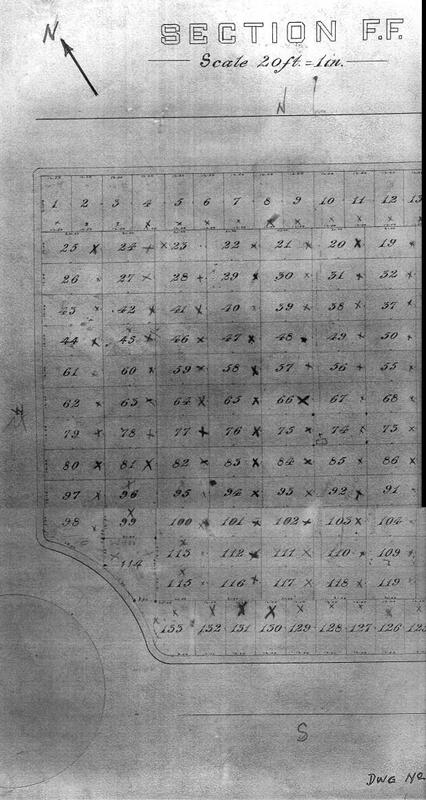 Cemetery Plot Map: Detailed plot map for locating the graves of Joseph and Anna (née Muhl) Demske/Demski, plus their children Joseph J., Anna, Martha, and Catherine (Richert). 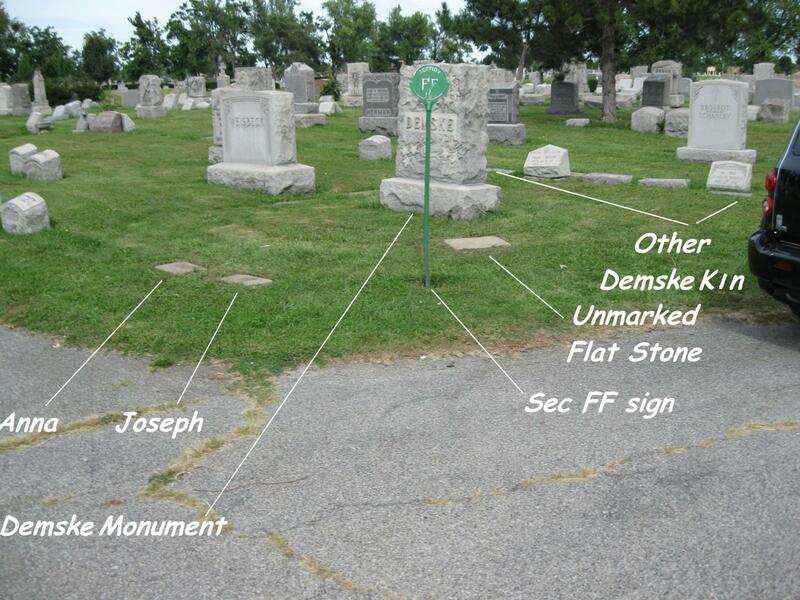 Lot 98, Section FF, United German & French Cemetery (Pine Hill), Cheektowaga, NY. 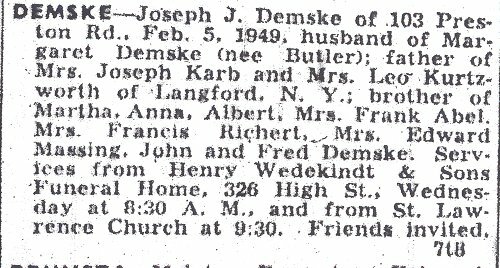 Obituary: Joseph J. Demske/Demski, Jr., son of Joseph and Anna (née Muhl) Demske/Demski and husband to Agnes (née Schwert) Demske/Demski. Joseph died in Buffalo, NY on Feburary 5, 1949. The obituary shows Joseph to have been re-married. Interment Record: Joseph J. Demske/Demski, Jr., died February 5, 1949, interred February 9, 1949, Lot 98, Section FF, United German & French Cemetery (Pine Hill), Cheektowaga, NY. 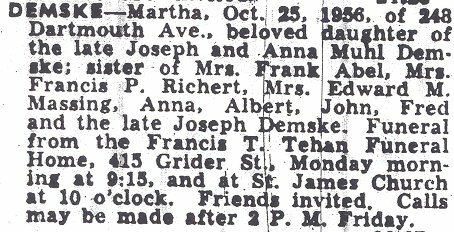 Obituary: Martha Demske/Demski, sister of Joseph Demske/Demski, Jr., died in Buffalo, NY on October 25, 1956. 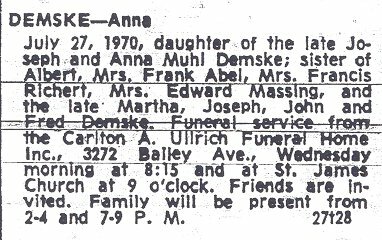 Obituary: Anna Demske/Demski, sister of Joseph Demske/Demski, Jr., died in Buffalo, NY on July 27, 1970. 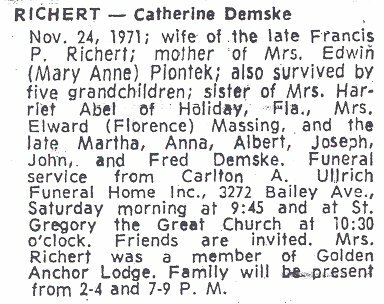 Obituary: Catherine (née Demske/Demski) Richert, wife of Francis P. Richert and sister of Joseph Demske/Demski, Jr. Died in Buffalo, NY on November 24, 1971.